The real significance of the word martyr comes not from the dying but from the witnessing, which the word means in its derivation. People who are willing to give up everything, their most precious possessions, their very lives, put a supreme value on the cause or belief for which they sacrifice. Martyrdom, dying for the faith, is an incidental extreme to which some have had to go to manifest their belief in Christ. A living faith, a life that exemplifies Christ's teaching throughout, and that in spite of difficulties, is required of all Christians. Martin might have cut corners as a way of easing his lot, to make some accommodations with the civil rulers. St. Paul had a conversion experience on the road to Damascus. Many years later, the same proved true for Peter Gonzalez, who triumphantly rode his horse into the Spanish city of Astorga in the 13th century to take up an important post at the cathedral. The animal stumbled and fell, leaving Peter in the mud and onlookers amused. Humbled, Peter reevaluated his motivations (his bishop-uncle had secured the cathedral post for him) and started down a new path. He became a Dominican priest and proved to be a most effective preacher. He spent much of his time as court chaplain, and attempted to exert positive influence on the behavior of members of the court. After King Ferdinand III and his troops defeated the Moors at Cordoba, Peter was successful in restraining the soldiers from pillaging and persuaded the king to treat the defeated Moors with compassion. After retiring from the court, Peter devoted the remainder of his life to preaching in northwest Spain. He developed a special mission to Spanish and Portuguese seamen. He is the patron of sailors. 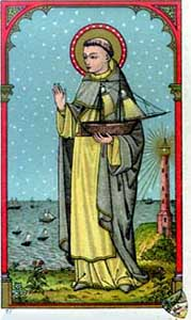 Peter Gonzalez died in 1246 and was beatified in 1741.